Its region of origin is the Bourbonnais and its ancestor is, probably, the Aylesbury English duck though it carries itself less horizontally. It is of nice size (male : 4 kg ; female : 3. kg), very hardy, massive, stocky, but also lively and jaunty with white plumage devoid of spots or sulphurous reflections. It grows fast. The female lays early in life, white eggs weighing 80 g.
Tracing its origins like the fowl bearing the same name to the town of Bourbourg, this duck has never known any real development in France except in the area of Bourbourg it where it was the object of active trade. Having the Mertchem duck (Belgium) and Aylesbury (England) duck for ancestors, it first appeared around the end of the 19th century and nearly disappeared towards the middle of the 20th. Nowadays, several breeders are still selecting this breed. One should be careful not to confuse it with other white ducks. Its standard was established in 1924. Its main characteristics are the following ones : a large, massive body, almost horizontal, well fleshed out, pinkish-white bill ; orangy-yellow tarsus, dark eyes, white plumage. Under the reign of king Phillip IV of Spain (1621 - 1665), many Spaniards choosing to live in exile settled in the marshy regions of Vendée and Brittany ; they transformed the old gulf after draining it into a sort of polder.It is in this manner that the breeding of the duck of Challans began and that the supply of table ducks to Nantes was ensured as it was in the early 18th century. The traditional method of breeding leaves the ducks free to go from the farmyard to the canals where conical rush nests are disposed on the banks. The females mate not only with the ducks of the farm but also with wild ducks passing by in the course of migrations. The ducklings are either left to the female or given to the care of a dwarf hen. As they are growing older, the duckling will be fed by farmers provides but will also eat caterpillars, insects, larvae, slugs, snails and tadpoles. At about 8 weeks (of age) they are kept in a pen for purposes of intensive fattening. 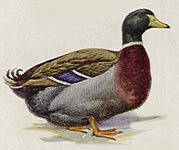 Having originated from the Normandy, this duck bears the name of a Norman town. The standard of the descendant of regional ducks, was established on November 23, 1923. However, in many European countries, similar breeds are recognized under different names such as the Termonde duck (Belgium), the Swedish ducks and the Pomeranian (Germany) ones. 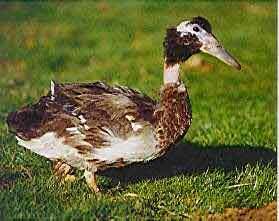 It is easy to get black ducks with a white dewlap by crossing Rouen type ducks with black or white breeds. It is then necessary to select the ducks obtained to get subjects which will conform to the standard. The male should weigh 3 kg, the female 2.5 kg and the eggs 70 g : they have a regular shell color, sort of blueish green. The Northern area has also the Estaires duck on the top of the Bourbourg hen and duck. 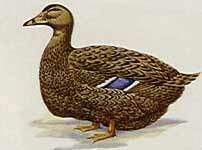 Probably developed from the Pekin, this duck lived on the banks of the Lys river, which passes through Estaires. Little known outside of its native region it has become a rare nowadays. Having the same shape than the Bourbourg duck, it is smaller (2 to 2.5 kg), it is also rustic and it grows fast.It is also a good egg layer but of less fine flesh than the Bourbourg. Le canard de Rouen clair (clear Rouen duck) : This duck has been bred in the Rouen region for ages. It is the result of selecting Colvert ducks although its volume has been increased. Subjects weighing 3.5 kg have thus been obtained. Since this selection was mainly carried out in the last 30 years of the 19th century, the breed was replaced by others in 1910. At that time a breeder named Garry undertook to revive the breed by improving its volume. From 1910 to 1920, he obtained subjects weighing 4.5 kg by crossing it with Colverts. One can consider M. Garry as the real creator of the Rouen which was given a standard in 1923. The clear Rouen duck which has some very tasty flesh is one of our highest yield ducks. The female lays eggs weighing 80g minimum and with very clear greenish shell. Le canard de Rouen foncé (dark Rouen duck) Breeding from the clear Rouen, English breeders selected it for the traits that were to become the dark Rouen duck. It is very different from the clear Rouen, less elegant and of darker colour. It moves with greater difficulty and more slowly, mating is quite laborious. The female lays very little, eggs weighing 80g minimum. They have greenish shell, with clearer (whitish) or darker (blueish) shades. The male weighs 3.5 kg the female3 kg. In each fowl category, France has very well-known breeds abroad : for chickens it is the Bresse ; for Geese, it is the Toulouse and for ducks, it is the Rouen. 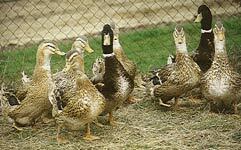 Most foreign Rouen duck amateur breeders choose the dark variety ; the clear French variety has been recently recognized abroad.